The list is endless, but slotted somewhere near the top is spearfishing. Spearfishing is one of the most satisfying activities one can engage in. It’s one of those simple moments in life, but moments that bring pure joy no less. Combine the sport with paddle boarding and you a serious activity ahead of you. 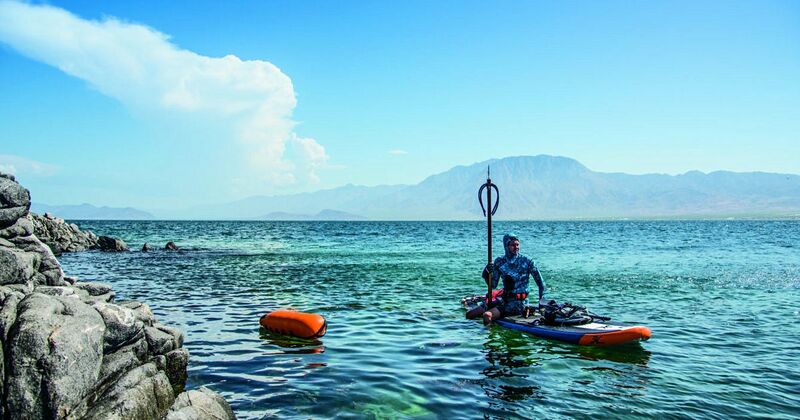 In order to hunt and spearfish underwater, spearfishing usually requires a few key things namely, good technique, patience, concentration and the right equipment. Assuming you got the other three, the aim of this guide is to share with you the best tools for the job. Getting the right equipment is probably the most crucial step before you try your hand in spearfishing. Trouble is, the market has become flooded with a myriad of options and brands that making an enlightened decision can prove a tough ask. Often, though, spearfishing guns fall under two broad categories based on how they generate their projectile power. Knowing the difference will help decide which suits your style. Considered to be the original speargun, these are the most basic and are more popular with beginners and experts alike. Also known as a rubber speargun, this type fires spears with the aid of a rubber band(s). The bands need to be replaced every so once in a while (typically 6-12 months if you use it often) and can be costly to maintain. Since they are quieter, they are the ideal choice if you want to operate stealthily underwater. This type uses compressed air to launch spears. Pneumatic spearguns are more powerful and most practical in deep waters. They are typically smaller and more compact since they rely on compressed air for power, making them easier not to just shoot with, but also carry. Loading a speargun, however, can be a tall order if you don’t have experience using them. These will also be better to take on your paddle board. As far as the models themselves go, here are a few recommendations that will help you get the most out of your underwater fishing trips. 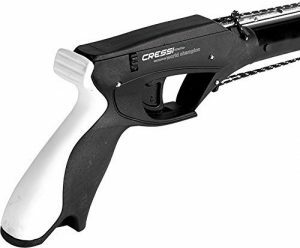 The Cressi Apache is an entry-level speargun if you don’t want to drop major coin. It is available in four different sizes, ranging between 35cm (13.8 inches) for the smallest and 75cm (29.5 inches) for the largest. This is an ideal speargun for those just making their first forays into the underwater hunting game. One of the things you will notice about this speargun is that it is incredibly compact and lightweight. This makes it not only a great option for those who love to take their equipment with them, but also increases its accuracy and maneuverability – another way of saying this gun can be a perfect fit for use in close quarters such as caves and reefs. The Cressi Apache features a tough anodized sealed aluminum barrel which makes it ultra-durable and requires less maintenance. The closed muzzle and single 0.5-inch band mechanism is something that will appeal to beginners as it allows for easier and faster loading of the spear. An advanced Tahitian style flopper forms the shaft, guaranteeing lots of speed and power. This aspect actually makes it a versatile device for all kinds of hunting, especially considering the barrel is wide enough to accommodate an assortment of spears. The Cressi Apache speargun gives you two power options with a single flopper spear tip (Tahitian) and dual-notch stainless steel shaft. Ideal for small and medium-sized game fish, entry-level spearguns don’t come any better than this. The Comanche Speargun is another great option for beginners courtesy of the awesome Cressi team in Italy. It boasts a high-quality build and has been one of the top picks for spearos for some time now. AB Biller Wood Special Speargun, Teak, 60"
Next up on our list of best spear guns is this offering from USA-based AB Biller, a brand often preferred by many professional spearfishers. The Wood Mahogany Special Speargun will get the job done regardless of the type of fish you are out on the hunt for. It comes in a long list of sizes (seven), spanning from 24 to 60 inches, making it highly versatile for hunting. The greater the length, the greater the power, although this speargun features a pair of 9/16-inch rubber bands that guarantee enough power already. You have the option to swap these bands for more powerful ones, though, or even include a third one if you want to add more distance and power in your shot. One of the things that will catch your eye first about the AB Biller is that instead of featuring a stainless steel shaft as listed, the gun comes with a wood shaft. But this is no ordinary wood. It is manufactured using a single piece of mahogany which has been treated with three coats of polyurethane, making it ideal for use even in saline waters. This means it is strong and durable, and the material comes with the added bonus of offering natural buoyancy. The top of the gun also features a groove which improves accuracy and helps reduce noise. An attached dual string makes it possible to rest the gun on your shoulder when shooting without having to strap it on and off every time. The AB Biller Mahogany Speargun comes with a double barb rockpoint tip constructed from hardened stainless steel. This, coupled with the stainless steel trigger, are testament of the quality the American maker has maintained on this speargun. In fact, if craftsmanship is a deciding factor for you when choosing between the best spear guns, you got the perfect gift right here. No pros & cons for this speargun, its ALL good!! The Sawed-Off Woody Magnum Spear Gun by JBL is a relatively new product in the market which has not escaped the eye of the ardent spearfisher, partly thanks to its excellent craftsmanship. This is a gun that was designed with vet spearos in mind, from top to bottom. For one, this is notable in the ergonomic and comfy grip it provides, not to mention the bold muzzle design with the capability to hold multiple bands. It has a medium length which means you won’t have to compromise your agility in the water much, and the trademark sawed off design has a greater power output than you would expect. A latex sling pairs dual Nitro 20-inch slings are paired with a latex sling, with a three-piece M8 trigger laser-cut from steel with the end goal of handling tons of pressure (up to 2,400 pounds). The trigger, however, has managed to maintain a smooth pull, with JBL offering you a lifetime warranty for the same. Hand-Selected African mahogany makes up the body and is fitted for precision with an integrated shaft track. The wood construction makes the gun buoyant for easy handling underwater. The shaft itself is subjected to heat treatment to ensure hardness and is also hand-tuned for alignment. This speargun promises optimal energy transfer. Despite the impressive range and power synonymous with the JBL Woody Magnum Spear Gun, this is a weapon even beginners will achieve great results with. This is easily among the top contenders for best spearfishing guns. You will find it a reliable companion if you are looking for medium to larger-sized fish, and a companion capable of staying with you forever. This is a pneumatic speargun which makes for a very powerful hunting tool. Its short stature makes it ideal for hunting small game fish, as well as reef fishing and snorkeling. The Mini Mini version is the shortest in a range comprising 5 models, starting at 16.5 inches through to 39.4 inches. Mares is one of the star names in scuba diving equipment in Italy, so it’s suffice to say they know a thing or two about their craft. Indeed, in this offering, the Italian manufacturer sought to bring together power, precision and reliability, and it’s clear they managed to pull this off remarkably. The Mares Mini Mini is equipped with all the things a spearfisher needs, including a shock line, pump, loader and holster. It can take both 8mm (5/16”) and 7mm shafts and can be fitted with spears of varying sizes depending on what you are hunting. The Mares Mini Mini promises good precision at great depths, thanks to a combination of features such as a hydrodynamic muzzle, 8mm shaft with a double barbed tip, and an ergonomic handle capable of absorbing shock. It has a high-capacity air tank which also allows a couple of powerful shots with each recharge. It’s not often that you come across a short super lightweight speargun which doesn’t compromise on speed and power. And that’s one of the prime reasons the Mares Sten Mini Mini stands out. Capping off our list of best spear guns on the market is this offering from Ocean Rhino which is a great option to usher yourself into the world of serious spearfishing. It is a pretty badass gun which is built with pro fishers in mind. Measuring 53 inches, it is longer than the Biller, bar two models. This is a comfortable gun with a great grip and a muzzle design that can hold up to 3-5/8-inch diameter bands. The Ocean Rhino RX has a durable coating which guarantees many years of use without a change in the aesthetics. It is also fitted with two safety levers on the left and right, each with adjustable tension. What some like most about this speargun is the fact that it is highly customizable. You can increase the versatility of the gun and boost up its power even more by picking up additional accessories such as the muzzle and grip kill spike, as well as the dual shaft holders. By and large, this is a highly accurate and powerful gun which can be trusted to go about its business quietly. It also has a very long range and is easy to handle underwater. You will also appreciate the speed when loading the line as it is nothing short of remarkable. As far as the best spear guns go, the Ocean Rhino is right up there with the best of them. This is one well-built gun.